This state-of-the-art technology improves both shock - absorption and bounce performance. This exclusive trampoline can be tuned for different age, weight, and skill levels, yet it also broadens the performance spectrum so that jumpers with a wider range of weights and skill levels can safely enjoy the same set up. Easier to install safety net. We've pre-sown the enclosure door to help you with installation and the square orientation gives you a cleaner look. This tighter design actually extends the life of your net and reduces your maintenance costs while increasing the the strength of the system! 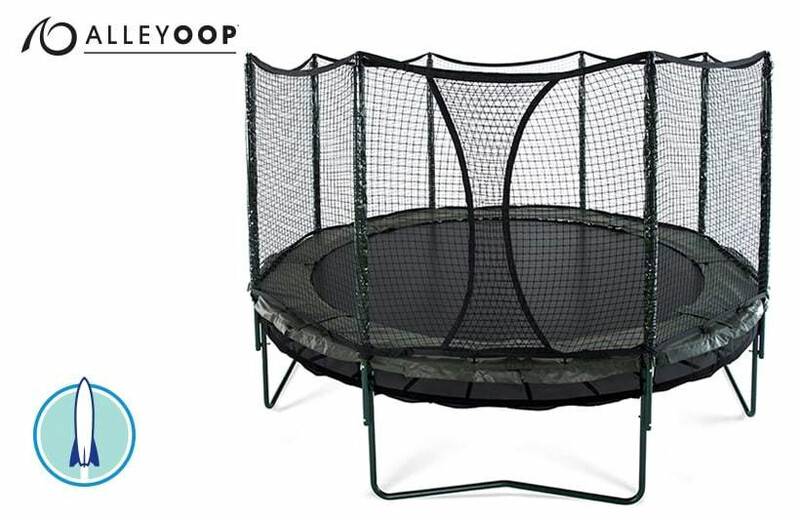 The AlleyOOP PowerBounce trampoline has all of the features and specifications of the Variable Bounce Trampoline (see details) as well as some exclusive advantages listed below. The 10' trampoline has 72 primary springs and 18 PowerSprings for a total of 90 springs.